A warning has been issued by the International Olympic Committee (IOC) to the World Baseball Softball Confederation (WBSC) after the Israeli Flag and Federation name plate was removed at its Congress in Hammamet, Tunisia, earlier this year. This followed a report this morning by Patrick Hickey, the International Olympic Committee (IOC) Delegate Member for Autonomy, on the second of three days of IOC Executive Board Meeting's here. In a statement, the IOC "noted that the WBSC reacted quickly to the incident and addressed this issue quickly when contacted by the IOC task force, with the Tunisian Baseball Softball Federation handed a six month suspension". It was added: "Following the recommendation by the IOC task force, the IOC Executive Board decided to issue a warning to the WBSC regarding this incident to ensure that a similar situation is not repeated in the future". This was in view of the "critical importance of maintaining respect for all members of the Olympic Movement and upholding the Olympic values at all times". IOC President Thomas Bach described the warning as "a clear signal that the IOC is not accepting any kind of discrimination". This follows the sending of a letter sent last month - seen by insidethegames - in which Israel Association of Baseball President Peter Kurz urged WSBC chief Riccardo Fraccari to "severely reprimand the Tunisian Federation" and to "sanction them from holding any international events or tournaments until they are publicly ready to welcome every country's participation". The WSBC are cooperating fully with the IOC inquiry and have already taken steps to ensure this does not happen again, a spokesman claimed to insidethegames. The spokesperson claimed they do have regulations in place to prevent discrimination but have further tightened these measures to ensure there is no risk of a similar occurrence involving any future host cities. As well as the six month suspension, the Tunisian Baseball Softball Federation will also have to prove they have studied the WSBC Articles as well as the IOC Charter before returning to the fold, it was added. 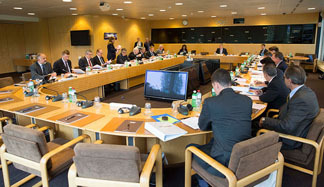 The incident, however, will hardly help the WBSC's campaign to regain its place on the Olympic programme at Tokyo 2020, still a possibility pending the outcomes of the Olympic Agenda 2020 reform process also being discussed by the IOC Executive Board here. But speaking this evening, the IOC Sports Director and Deputy Olympic Games Executive Director, Christophe Dubi, said that he "didn't think" it would have an influence on that front, but "provides a strong signal to all International Federations that these kind of issues do not surface in their General Assemblies and events in the future". "It is not necessarily a blow for that Federation but a sign from an institutional sign point, it is a signal that they have to be proactive and not allow these sorts of things to happen," he added. As the long-standing unrest in the Middle East continues, there have been several examples of Arab countries, including Tunisia, being rebuked for some sort of discrimination against athletes or officials from Israel in recent months. Last October, official warnings were issued by the International Swimming Federation (FINA) to organisers of World Cup meetings in Dubai and Doha after the name and flag of Israeli athletes appeared to be censored in pre-race introductions and television broadcasts. Swimmers from the country were also ignored in coverage. In the same month, Tunisia's number one ranked tennis player, Malek Jaziri, was ordered by the Tunisian Tennis Federation to withdraw from a match against Israeli opponent Amir Weintraub at a tournament in Tashkent. But in April this year, it was announced in a wider political sense that the north African country was normalising relations and allow Israelis to visit the country, reportedly in a bid to boost the Tunisian tourism industry.